You may have read my recent home wear wish list you will know that I am on the hunt for some lovely new home wears as me and Darren are soon planning to buy our first home together. 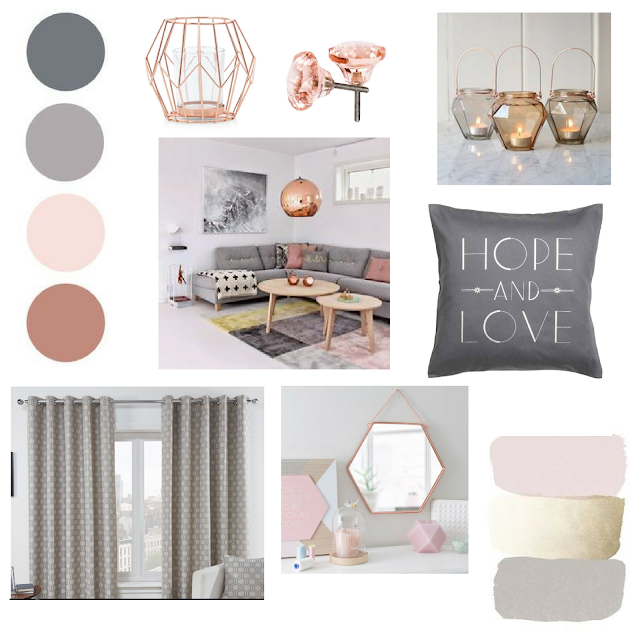 As we have no storage at the minute I cant go crazy and buy thing but I can put pretty wish lists together and make inspiration boards. I am really keen on having a Grey, Copper and blush coloured living room. I love the colour combo and am a bit set on a big comfy Grey sofa.I'd also love some pencil pleat curtains like the ones featured above as I think they make a room look homely and warm. I think small accessories like cushions, candles or even the pink drawer nobbs can just add a little bit of colour in to the room. The small finishing touches will make the room look so much more sleek and like you have your Sh*t together. (In my opinion anyway). While we was in Thailand me and Darren picked up a gorgeous grey throw that has a elephant pattern on so I can not wait to have that displayed in my home.